Naval Missile Test Freaks Out L.A.
A missile launch over the Pacific was seen by a lot of people Saturday night. 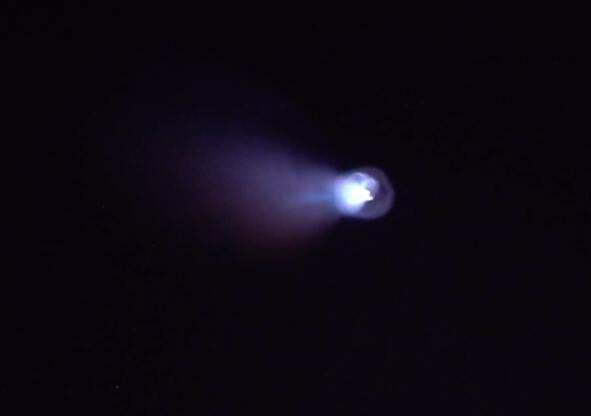 A mysterious light seen off the West Coast of California freaked out a lot of people Saturday night. Twitter lit up, with thousands of pictures and videos of the object. Let me cut to the chase: As I write this (04:00 UTC; 20:00 Pacific) the best explanation is that it was an unarmed Trident II (D5) missile test launch from an Ohio-class submarine, as reported in the San Diego Union Tribune. This does appear to fit what was seen. The Trident II is a three-stage solid fuel missile built by Lockheed Martin. The expanding halo of light is likely to be a staging event: when one stage shuts down, is ejected, and the next stage ignites. Ordnance (a small explosion) is used to separate the spent stage. If the missile were above most of the atmosphere, you’d expect to see a bright flash and an expanding ring of gas from the staging ordnance. As it happens, the military had activated a no-fly zone, so to speak, west of L.A. starting Friday night, apparently in preparation for this. I haven’t heard if that has been taken down yet; if this was the only test, then I’m speculating it might be. It’s common that the military does not announce these tests before hand, which is why no one in the public knew it was going to happen. The event was seen in Northern California (Santa Rosa) and as far east as Nevada and Arizona (though it was very low to the western horizon from there). This shows just how high up the missile must have been; a couple of hundred kilometers at least, I’d think. 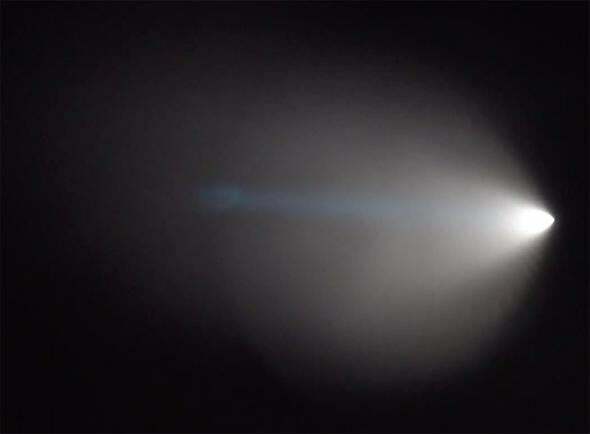 It was seen west of Los Angeles, moving roughly south to north. That too makes sense; it was probably launched from the ocean hundreds of kilometers west of L.A., sent to the north, away from populated areas. I’m not sure why they didn’t do this even farther west, where no one would see it, but I assume the military has their reasons. The ring on the right is most likely from the missile staging event. I heard from people on Twitter starting around 6 p.m. Pacific time, and then pictures started popping up. They showed a bright dot with a fan-shaped cone of light behind it. I was immediately pretty sure it was a rocket launch; this reminded me of footage I’ve seen before (like the infamous Norway Spiral from 2009). I wasn’t surprised to see a lot of mutually contradictory tweets about it from relatively reliable sources; some said it was a meteor—the annual Taurid meteor shower peaks now, but this was moving far too slowly to be a meteor, and the behavior was all wrong. The videos all had running commentary from people showing shock, surprise, and fear (tweets reflected this as well). Fair enough; if I didn’t know what I was seeing this would be pretty scary. Perspective is a problem here; it’s hard to know exactly how far it is, and which way it’s going. That’s very common in footage like this. Watch an airplane on the horizon headed toward you, and it looks like it’s headed straight up. It’s an illusion, but a convincing one, and if you’re not familiar with the geometry, it’s easy to get fooled. So I’m certainly not faulting anyone for freaking out! I wonder how many people saw this? Millions? Hundreds of thousands, I’m sure; it was just after sunset in a city with several million people. Speaking of L.A.: Hollywood types, take note of the reactions people had. If there were an impending disaster (missiles, asteroids, UFO, what have you) here’s a grand, well-documented, and time-tagged real-life experiment for you. Now we know how real people react when they see something totally bizarre in the sky.